Build your movement. Beat the system. A board game about people winning together—even when the cards are stacked against us. You can also order Rise Up Expansion Packs here. You can also order the Rise Up Education Kit here. You can order the Rise Up Poster Series here. Lead a march of thousands of people. Write a protest song that goes viral. Fight for what you believe in. Rise Up is a cooperative board game about building people power and taking on oppressive systems to create change. It’s ethically manufactured and made by the creators of Co-opoly: The Game of Cooperatives. In each game of Rise Up, players take creative actions to fight for victory. Everyone wins or loses together. The game weaves a story about your movement, which can either be based in reality (like stopping an oil pipeline) or fictional (like fighting for dragon rights). But “the System” is hard at work too, maneuvering to crush your movement through tactics like setting up surveillance, making arrests, or causing infighting. 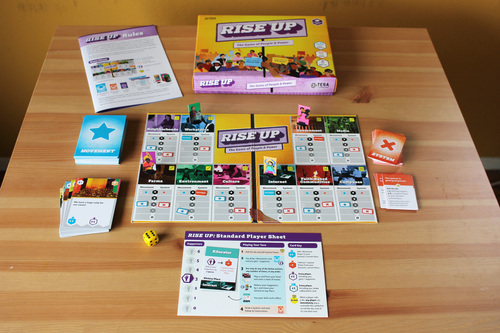 A great choice for game nights with friends and family, Rise Up is an alternative to many mainstream board games that feature themes of conquest, exploitation, and warfare. It’s a strategy game that can only be won through player collaboration. And we’ve done something innovative: just flip the board over, and you’ll be able to play Rise Up Simplified, a version that’s quicker to learn and that has simpler rules. Rise Up Simplified is appropriate for younger kids and people who have less experience with games. It can be played with co-workers, in workshops, trainings, after hours at conferences or retreats, and in community organizing settings where time is of the essence. At the start of each game, players come up with a movement they want to create. It can be serious or silly. (Such as “fighting for a living wage” or “free pizza for everyone.”) Then the game naturally teases out the story of your movement as you go. Players have to gain supporters in order to play Movement Cards like “We organize a massive march!”, “General strike,” “We take time to help out our neighbors and build our community,” and “Someone writes a protest song.” These cards allow players to build their movement, take on the System, and help their fellow players gain supporters and resources. The goal is to grow your movement power in different places across the board. But watch out, because the System is fighting back. With cards like “Smear campaign against our movement” or “Arbitrary arrests”, the System will make you lose supporters and resources while it cements its own power. Players lose if they run out of supporters or if the System gains too many victories. Players win if they score more victories than the System. Rise Up also has unique cooperative game mechanics that keep players interested and engaged during the whole game, even when it’s not their turn. – Nine year old game tester of Rise Up Simplified. We’re dedicated to manufacturing Rise Up in an ethical way. It ise produced in the United States, and nearly 100% of the money spent on the manufacturing has gone to a worker-owned company using environmentally friendly resources whenever possible. This is groundbreaking for board games—as far as we know, it has never been done before for a game of this scale or scope. Rise Up is a product of the TESA Collective (The Toolbox for Education and Social Action). TESA creates tools and programs for your cause. Want to learn more or work together? Go to toolboxfored.org. Brian Van Slyke of the TESA Collective is the game designer and project lead for Rise Up. Graphic Designer: Molly McLeod. Molly McLeod is a designer, artist, and educator based in Oakland, California. She helps nonprofits and organizations working toward social justice communicate more effectively and design awesome things. TESA previously worked with Molly on the graphic design of Co-opoly: The Game of Cooperatives, and we’re thrilled to be collaborating with her again. Artist: Design Action Collective. We’re excited to team up with Design Action Collective, a social justice, worker-owned, and union design and visual communications studio based in Oakland, California. Design Action is making beautiful, custom art for Rise Up’s cards, board, and box. Innosanto Nagara is bottom-lining the illustration work. He is the author and illustrator of the children’s books A is for Activist, Counting on Community, and the upcoming My Night in the Planetarium. Printer: Community Printers. Since 1977, Community Printers have been engaged in high-quality commercial printing. They are also a worker-owned cooperative. They are especially proud of their history of community involvement, social activism, and commitment to environmentally friendly printing. Community Printers and the rest of the Rise Up team have been collaborating closely to figure out how to manufacture Rise Up so that it is accessible to the public. Well, sounds like a pleasant pass-time for the bourgeoisie.